• Bottesini, Tarentella. 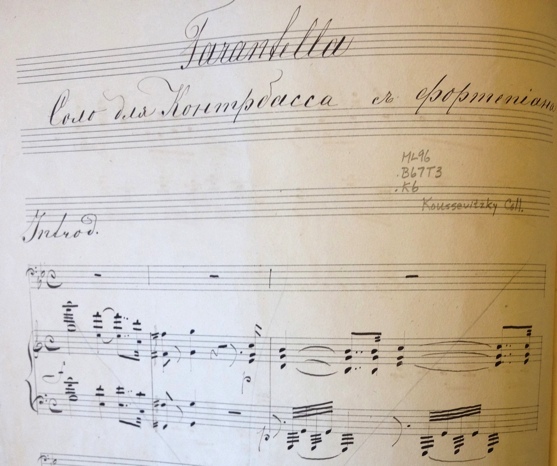 One of the most popular of Bottesini's works for bass and piano, Koussevitzky's hand-written performance material for this piece is in BPL (Figure 3). He performed the piece in his early career in Russia, at his Berlin debut in 1903, and frequently thereafter. • Bottesini, Fantasia "la Sonnambula." Arguably the best of Bottesini's seven pot-pourris, Koussevitzky first performed this piece in Berlin in 1907 and repeated it elsewhere afterwards. His performance material has not survived. • Henri Casadesus ("Lorenziti"), Sinfonia Concertante. As he did so often, Casadesus ascribed this composition to another composer from an earlier era: in this case, a certain Lorenziti — citations sometimes name Antonio [Joseph Antoine, c1740-89], sometimes his brother, Bernardo [Bernard, after 1749-after 1815]. Koussevitzky's solo parts in C and D (that is, for both the orchestral tuning of G, D, A, E and the common solo scordatura of A, E, B, F-sharp) are in BPL and reproduced in Stiles, Compositions, 144-60. Citations of early performances include Astrov, who cites a performance in the home and presence of Tolstoy in 1910, and Stoll, who cites the performance with the Berlin Philharmonic under Arthur Nikisch in 1911.23 The piece was brand new, since the online catalog of the Bibliothèque nationale de France gives the work a date of 1910; a review cites a performance of the cadenza alone as early as 1909.24 Koussevitzky later performed the work with Casadesus in Paris in 1921 and (perhaps) 1923, as well as in the Boston recital of 1928. 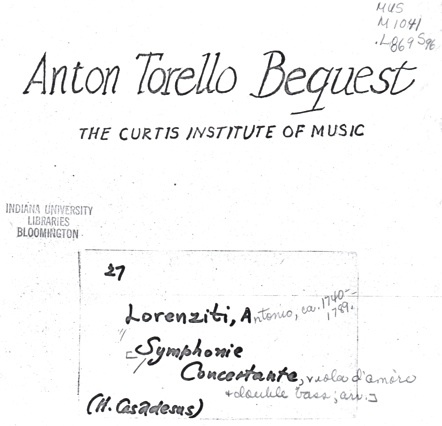 A hand-written copy of the piano score, (Figure 4), which makes it crystal clear that "Lorenziti" is actually Casadesus, is preserved in Anton Torello's papers in the library of the Curtis Institute (with a Xerox copy at Indiana University). Casadesus' manuscripts, including this piece, are in the Bibliothèque Nationale in Paris. • Gustav Láska, Berceuse. Czech double bassist Gustav Láska (1847-1928) composed a set of five pieces, op. 28, for bass and piano: "Idylle," Ländler," "Fantasie Impromptu," "Masurek," and "Ukolébavka." 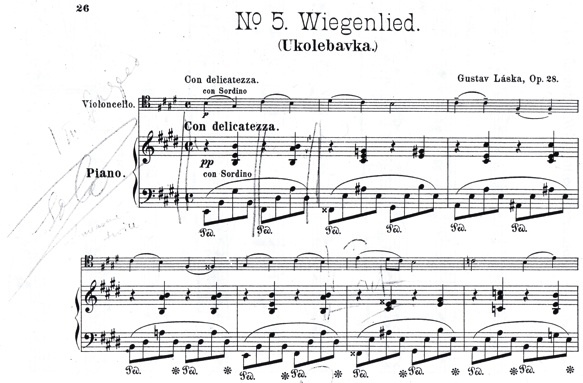 The fifth is Koussevitzky's piece, variously translated as "Berceuse," "Cradle Song," and "Wiegenlied." This should not be confused with Láska's additional piece without opus number for bass and piano, "Schlummerlied." As an additional complication, Láska arranged another "Wiegenlied," composed by Michael Hauser, for bass with quartet accompaniment, op. 11, no. 2.26 Koussevitzky's personal copy is in BPL, an edition of 1892 by Breitkopf & Härtel, (Figure 5). The other movements have no markings, suggesting that they were never performed. It is an odd quirk that Koussevitzky's personal copy is not of the original version for bass and piano, but rather the transcription for cello and piano. • Franz Simandl, Concerto. Astrov (20) cites a performance of this piece on June 22, 1899. According to a review in Musical Courier, Koussevitzky also included this work in his second Berlin recital of 1907 (as noted, he often remained in a city long enough to perform two different recital programs).27 It is a weak piece, rather like a pot-pourri of Simandl's famous etudes. It is unlikely that the citation is a garbled reference to Simandl's transcription of the Handel Oboe Concerto in G minor (discussed below), since the recital programs provided sparing information and excluded such information as editors and transcribers. In any event, the Simandl Concerto did not remain a part of Koussevitzky's performing repertoire. No performance material has survived.